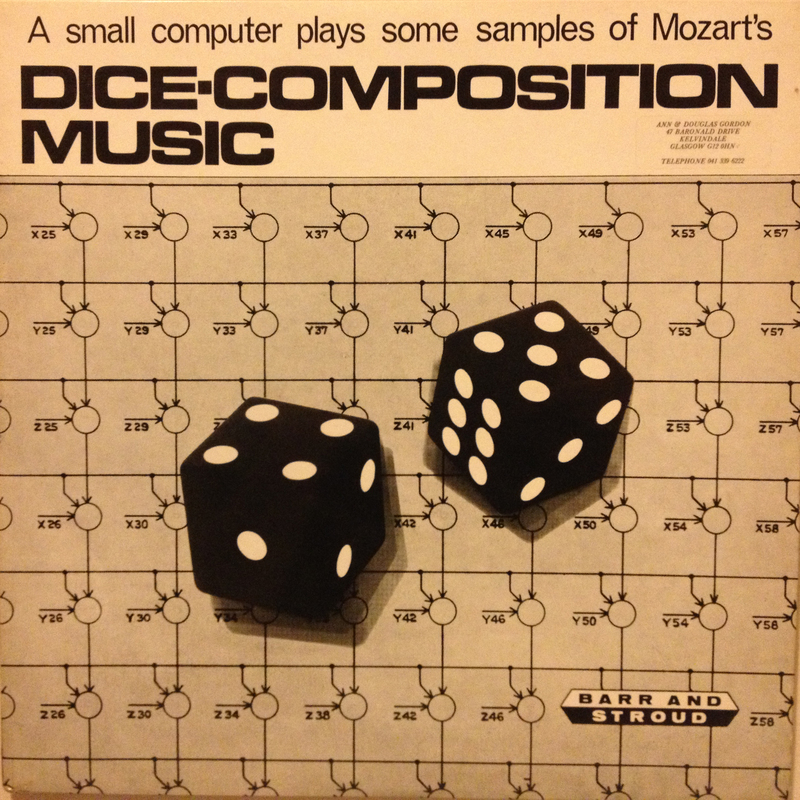 I found this record, snappily entitled A Small Computer Plays Some Samples Of Mozart’s Dice-Composition Music, in Oxfam Music on Byres Road, Glasgow, in late 2012. The sleeve suggested it was produced in Glasgow, in 1967. 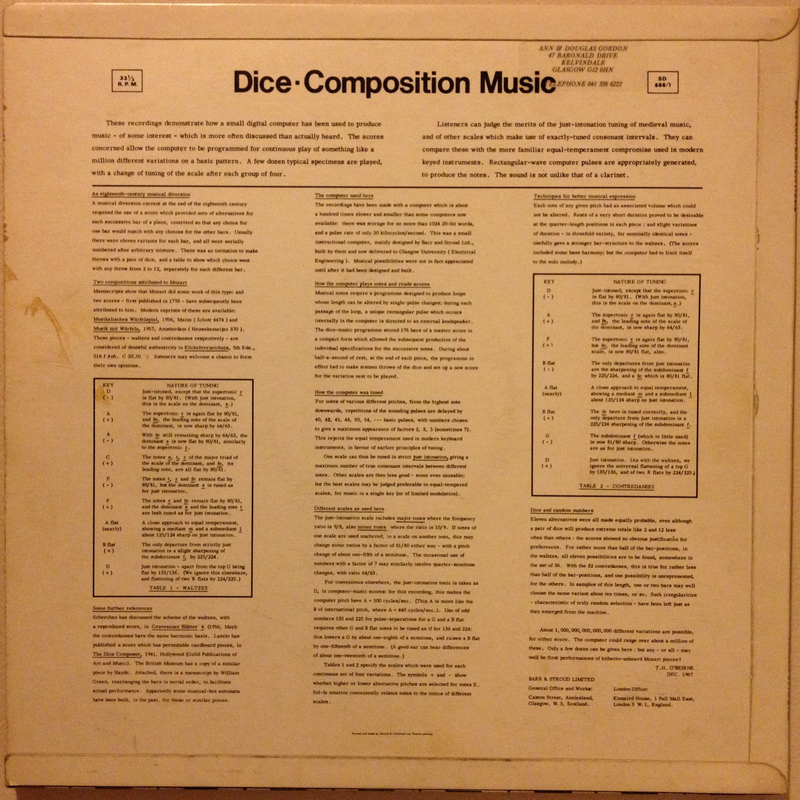 In 1962, Bell Laboratories had released the landmark Music From Mathematics album, using the IBM 7090 computer to produce a selection of weird sounds, classical arrangements and HAL-style ditties. In fact, their recording of Bicycle Built For Two is said to have directly inspired Arthur C Clarke and 2001: A Space Odyssey (dir. Stanley Kubrick, 1968). In 1967, while Kubrick was nearing the end of 2001‘s four-year production, Sgt Pepper’s Lonely Hearts Club Band was the best-selling record in the UK and the Incredible String Band released The 5000 Spirits Or The Layers Of The Onion. I basically had no idea anybody was making electronic music in Glasgow then. Bill Findlay, who taught at the University of Glasgow, provides a great selection of material on SOLIDAC on his website, including portions of SOLIDAC’s operating manual. You can also find a short essay by Paul A.V. Thomas, the principle designer of SOLIDAC, here. Thanks to Stewart Christmas for additional research. This entry was posted in Glasgow, Music and tagged 1967, Computer Music, Glasgow, Mozart, SOLIDAC. Bookmark the permalink.